Rajkumar Rao, who is in Lucknow currently shooting for one of his upcoming films, Behen Hogi Teri, recently attended a panel discussion there. The event which was called “The Samvad” was all about having a live interaction with the masses about the current affairs, happenings across the nation and sharing their viewpoints on same. 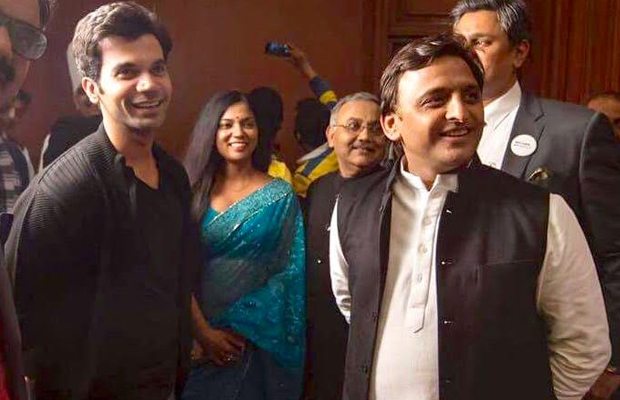 At the event, the actor was seen engaging with the Chief Minister of Uttar Pradesh, Akhilesh Yadav for some time. The actor was heard talking about cinema at length, current affairs and also about his experience of shooting for multiple films in Uttar Pradesh. Rajkumar Rao has been shooting back to back for his projects. He was in Lucknow earlier shooting for his film Bareilly ki Barfi and now he is back there shooting for Behen Hogi Teri. Previous articleBox Office: Sana Khan And Gurmeet Choudhary Starrer Wajah Tum Ho First Day Opening!